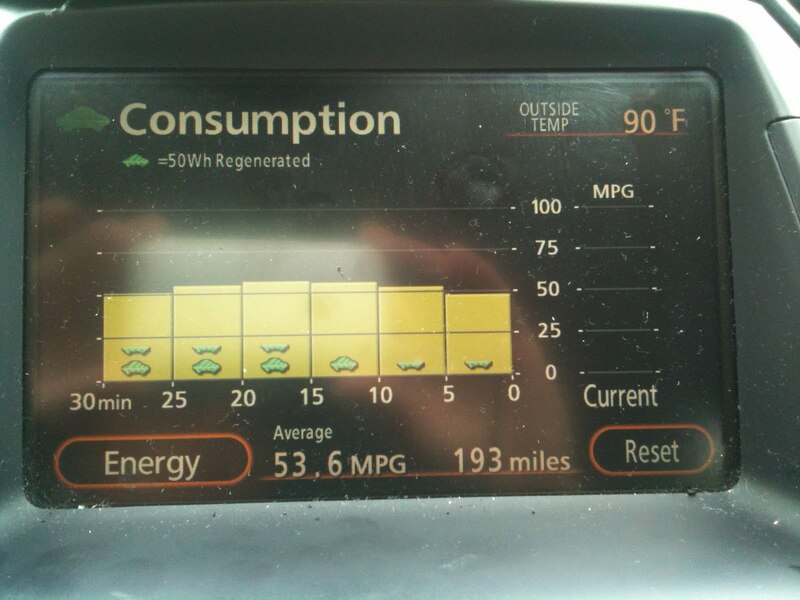 This is why it's wonderful to own a Toyota Prius! Yesterday and today I drove up to Long Island to pick up our boys from Dave's parents' house. Since it was a quick trip and could pack lightly, I was able to take our Prius, and since the conditions worked out well enough, I was able to score over 50mpg today! Yesterday, in the 100F+ heat coming up I-85 with full A/C and very little use of the brakes, the mileage was more like 46-48mpg. Once I got on I-95 where you can't just set the cruise control and the temperatures today were mostly in the 80s (it was raining most of my time in New Jersey). I'm pretty beat from the drive, but not at all in a bad way. I enjoy driving, and it was downright peaceful getting to enjoy the scenery with hungry, bored, or fighting kids. I was pretty worried about making the I-95 trek from Petersburg, VA all the way to New York City...to the point I even asked some Facebook friends their opinions of using U.S. 13 up the Delmarva Peninsula instead! According to Google Maps, taking US 13 would add about 60 miles and 70 minutes to my trip. I left my stopover point (my sister's house in NC) at the right time to go ahead and stay on I-95...I made it through (not around, through) Washington, D.C. around 11am, through Baltimore around 12pm, and through Wilmington, DE around 2pm. I crossed the Verrazano Narrows Bridge just before 4pm...which is about when the traffic started getting bad. Taking Highway 13 would have been quite out of the way from Petersburg, but it truly is a lovely route, and I've never sat in traffic out that way. If you're ever looking for a small town beach feel, you can't beat Cape Charles. It's one of those hidden treasures! Howie - Our Photographic Challenge!